Pamper your cars and seedlings with this new garage. It has two big parking bays, a big Storage Loft, and a Greenhouse or Potting Shed with doors big enough for your lawn tractor. 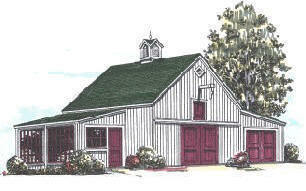 Simple, pole-barn construction makes this a practical choice for your new garage. Floor Area: 900 Sq. Ft., Loft Area: 380 Sq. Ft.